D, Kat Von — LA Ink star(?) 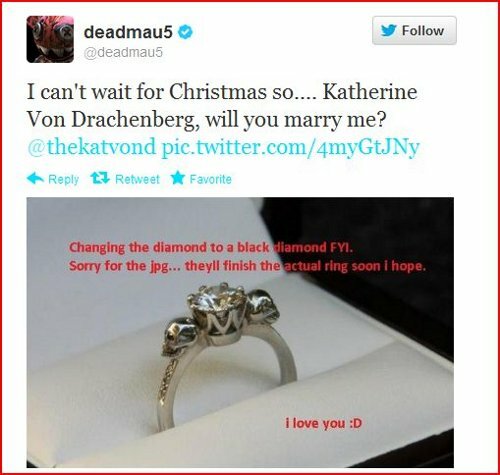 Kat Von D and her fiancé, popular DJ Deadmau5 — who you may remember got engaged over Twitter — have announced that their August wedding will be based on the H.P. Lovecraft short story The Call of Cthulu and will have an underwater theme including blue and green food and actors dressed as mermaids. So in case you’ve been wondering how ridiculous people get married, well, there you go. Hall of Fame, Songwriters — 25 year-old songwriter Benny Blanco, the scribe behind hits like Ke$ha’s “Tik Tok,” Katy Perry’s “Teenage Dream” and Maroon 5’s “Moves Like Jagger” is slated to receive the prestigious Hal David Starlight Award at the organization’s June gala event. In related news, the Songwriters Hall of Fame has just rocketed into the lead for least credible Hall of Fame in history. Marathon, Boston — We’d be remiss if TBTS didn’t mention our support out to all of those affected by the awful events of Monday’s Boston Marathon, where two bombs detonated near the finish line injuring 176 people and killing three, including an eight year-old boy. It’s sad proof that there is still evil within our borders, but a testament to the many, many brave responders that we still have one another’s back. Our thoughts are with you, Boston. Spielberg, Steven — As the head of the Cannes Film Festival Jury for 2013, sources say director Steven Spielberg’s yacht has left Ft. Lauderdale for France, where it is rumored that Spielberg will privately screen films and run the jury from his private yacht off the coast of Cote d’Azur. The yacht allegedly has luxury accommodations for 12 people and 26 staff members, which means that if the entire jury shows up he’s gonna need a bigger boat. Because…see? See there? You know, Jaws. Never mind. Young, Crosby Stills Nash and — This coming August 27th, folk rockers Crosby, Stills Nash and Young have announced the release of a live album cut from a performance during the band’s 1974 tour. Sources say the ex-bandmates allegedly all thought that the album actually did come out in 1974, but to be honest everyone was a little high back then.